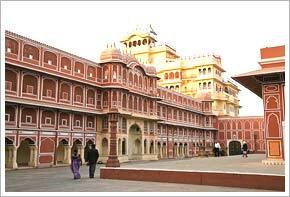 The City Palace is the brightest jewel in the necklace of the Pink City Jaipur. It is located in the capital city of Rajasthan and attracts tourists from all over the world. It was built by Maharaja Sawai Jai Singh of the Kachhwaha clan of Rajputs. Over the years his successors made beautiful additions to the palace. It stands out because of its superb combination of the traditional Rajasthani and Mughal style of architecture. The stunning mirror work and fabulous paintings beautify the interiors of the Palace. Occupying one seventh part of Jaipur, the City Palace is an amazing assortment of a series of gardens, courtyards, palaces and temple. A part of the Palace is still inhabited by the royal family. The seven storied Mahal is the landmark of Jaipur. Inside the boundary of the palace lie several arresting palaces adding to its charm. It is the most spectacular building of the City Palace. The interiors of this Mahal are festooned with imposing paintings and floral work. From here you can savor a picturesque view of the Jag Niwas Garden and the venerated Shri Govind Dev Temple. It has seven stories and each has been given a beautiful name. It once served as the reception apartment for the guests of the royal families where they were treated with great hospitality. Its foundation was laid in the 19th century by Madho Singh. Now it has been transformed into a wonderful museum displaying the graceful dresses and regal armory of the erstwhile rulers of Rajasthan. Here you will be rewarded with the sight of the two sterling silver vessels which are the largest vessels in the world. On his trip to England Maharaja Madho Singh II took along these two vessels filled with water from the holy river Ganga, to drink. This has now been transformed into an art gallery having a rare collection of original manuscripts of Hindu Scriptures. It was built for the lovely queens but now it is a museum showcasing weapons belonging to the rulers of the past. It was the resting place of the erstwhile Maharajas. Here they would eat, rest and make merry. The interior of this mahal is adorned with Mughal paintings. The dining table set here is made of glass and silver in European style. This flamboyant palace is ornamented with mirror work.